Who can use this Deed of Indemnity? 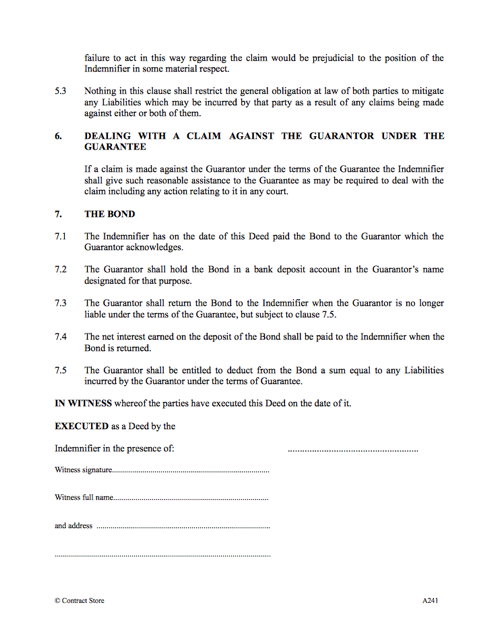 This Deed of Indemnity is designed for use in cases when one person (“the Guarantor”) guarantees the obligations of another (“the Indemnifier”) – usually under a contract between the Indemnifier and a third party; and the Guarantor gets an indemnity from the Indemnifier against any liabilities which the Guarantor may incur under the guarantee. What is this Deed of Indemnity for? The indemnity deed will identify the scope of the indemnifier’s obligations to a third party and of the guarantee being given to the third party by the guarantor. 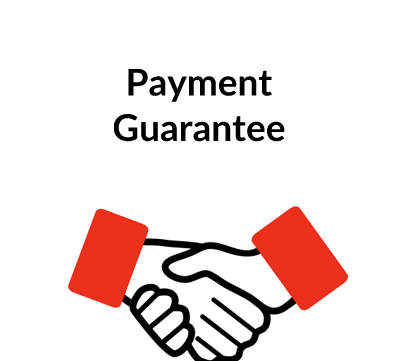 The guarantor is given security – probably a cash deposit – by the indemnifier as security for the guarantee. The deed will say what happens if the indemnifier receives or expects to receive a claim from the third party. It will also say how the guarantor will deal with a claim made against the guarantor by the third party and what happens to the security. 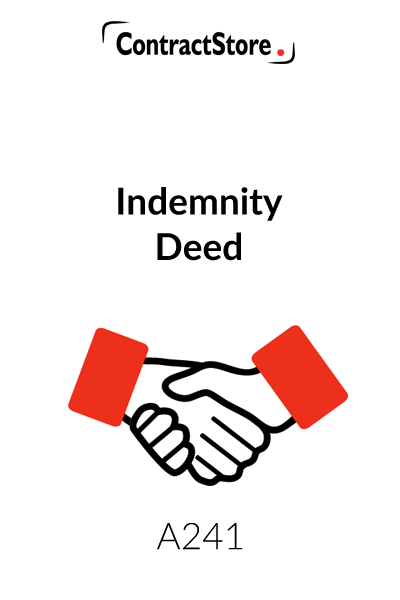 This Deed of Indemnity is designed for use in cases when one person (“the Guarantor”) guarantees the obligations of another (“the Indemnifier”) and seeks an indemnity from the Indemnifier against any liabilities which the Guarantor may incur under the guarantee. It may well be that an indemnity is implied by law in cases when a guarantee is given, but it is best that the exact terms are agreed between the parties. when the Indemnifier runs a shop and enters into an agreement with a supplier for the supply of stock and the Guarantor gives the supplier a guarantee that the stock will be paid for. 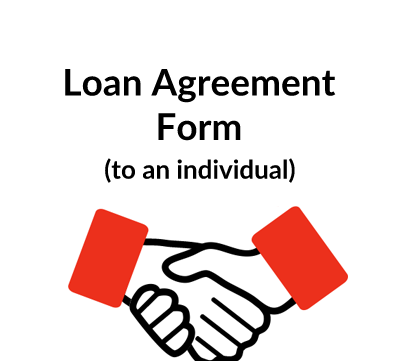 The Deed also covers the situation when the parties have agreed that the Indemnifier will pay a sum of money to the Guarantor as security against liabilities which the Guarantor may incur. This will be held by the Guarantor as a bond and the Guarantor will be able to deduct from it any liabilities which the Guarantor incurs. If possible, the Deed should be entered into simultaneously with the giving of the guarantee, though it can be given later. The full names of the Indemnifier and the Guarantor should be given along with their respective addresses. If either or both comprise more than one person, all names and address should be given. If a party is a company, the registered name, number and address should be given. “The Bond”: If the parties have agreed that the Indemnifier is to give the Bond, the amount should be inserted here and clause 7 will apply. This definition should, of course, be deleted if no Bond is being given, and then the subsequent numbering in this clause should be amended. 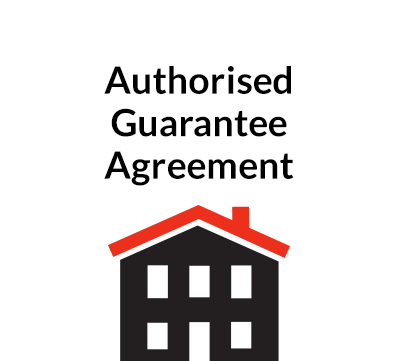 The guarantee given by the Guarantor in favour of John Landlord that the Indemnifier will pay the rent under the terms of a Tenancy Agreement dated 25th October 2011 and made between John Landlord (1) and the Indemnifier (2) relating to the Big House. The payment of the rent under the terms of a Tenancy Agreement dated 25th October 2011 and made between John Landlord (1) and the Indemnifier (2) relating to the Big House. These are standard provisions to avoid any doubts, though most are covered by the general law in any event. It is always helpful in a Deed to set out the background and these clauses deal with the basic situation. They should be amended or added to in order to suit the case. This clause gives the Guarantor the indemnity against any liabilities which the Guarantor may incur by reason of the Indemnifier failing to comply with the Obligation resulting in a claim being made against the Guarantor under the guarantee. These provisions deal with the situation when a claim is made by a third party that the Indemnifier is in breach of the Obligation. It is important that the Guarantor is notified as soon as possible of the details of the claim as it may result in a claim against the Guarantor under the guarantee. The parties may want to discuss how the claim is to be dealt with. However, it should be remembered that the Guarantor may now potentially have a claim against the Indemnifier under the Deed, and the position of both parties will need to be considered and perhaps legal advice taken. These provisions set out how the parties are to deal with the claim against the Indemnifier. The Guarantor may want to be involved in how the Indemnifier deals with the claim as this may determine the extent of the claim against the Guarantor under the guarantee. The Indemnifier may have documents and information which the Guarantor requires for dealing with a claim against the Guarantor under the guarantee. This clause obliges to the Indemnifier to give reasonable assistance. These provisions deal with the case when the parties have agreed that the Indemnifier should pay a Bond to the Guarantor as security. This clause should be deleted, of course, if no Bond has been agreed. Once the form of the Deed has been finalised, it should be produced and executed in duplicate so that each of the parties may retain one copy.